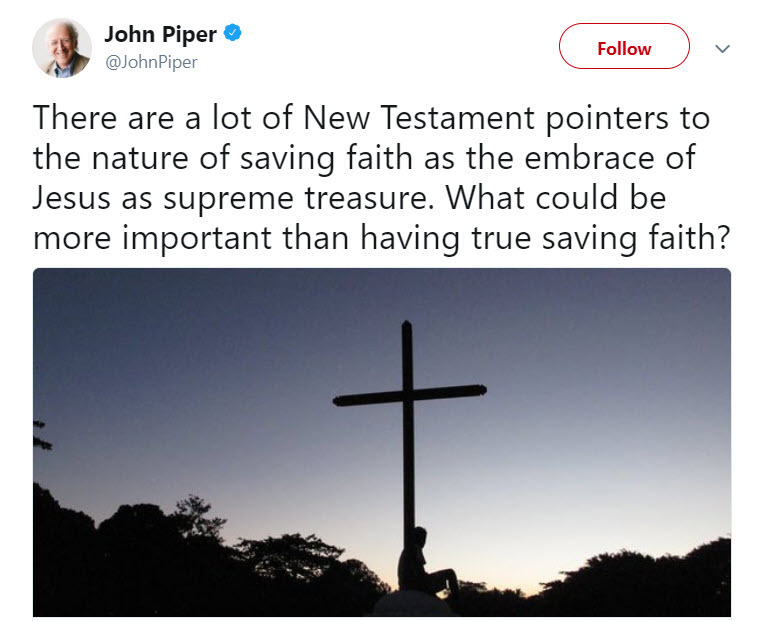 On his Twitter page John Piper writes: ‘There are a lot of New Testament pointers to the nature of saving faith as the embrace of Jesus as supreme treasure. What could be more important than having true saving faith?’ (7 March 2018). 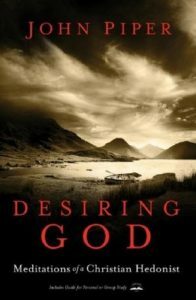 In his book Desiring God, Piper discusses his theory of conversion. He says that it does no good to tell an unconverted person ‘to believe in the Lord Jesus. The phrase is empty.’ And so, in recent years, he has asked, ‘Do you receive Jesus as your Treasure? Not just Saviour.’ He asks: ‘Could it be that today the most straightforward biblical command for conversion is not, “Believe in the Lord”, but, “Delight yourself in the Lord”?’ (DG, p55). Piper’s message is: ‘Unless a man be born again into a Christian Hedonist he cannot see the kingdom of God’ (DG, p55). He delivers the central point of his false dogma when he tells us that ‘Christ died to give us our heart’s desire: God’ (DG, p72). But this is heresy—Christ did not die to give us our heart’s desire, He died to save us from our sins. The apostle Paul writes: ‘For I delivered unto you first of all that which I also received, how that Christ died for our sins according to the scriptures’ (1 Corinthians 15.3). The apostle Peter writes: ‘For Christ also hath once suffered for sins, the just for the unjust, that he might bring us to God, being put to death in the flesh, but quickened by the Spirit’ (1 Peter 3.18). The Bible teaches that the God of Scripture, is ‘the justifier of him which believeth in Jesus’ (Romans3.26). It is the man who believes in Jesus who is justified in God’s eyes, not the man who embraces Jesus as his supreme treasure. 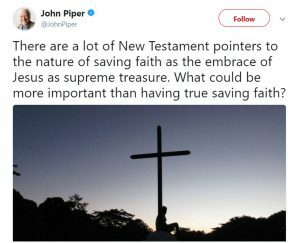 Piper has confused ‘believe’ with ‘treasuring Christ’, which is an undefined mystical concept, and by doing so he has departed from the historic doctrine of justification by faith alone. ‘Therefore being justified by faith, we have peace with God through our Lord Jesus Christ’ (Romans 5.1). ‘But as many as received him, to them gave he power to become the sons of God, even to them that believe on his name’ (John 1.12).